Savvy Spending: Potbelly Sandwich Shop: Buy one Sandwich or Salad, get one FREE! Today 6/1 only! Potbelly Sandwich Shop: Buy one Sandwich or Salad, get one FREE! Today 6/1 only! 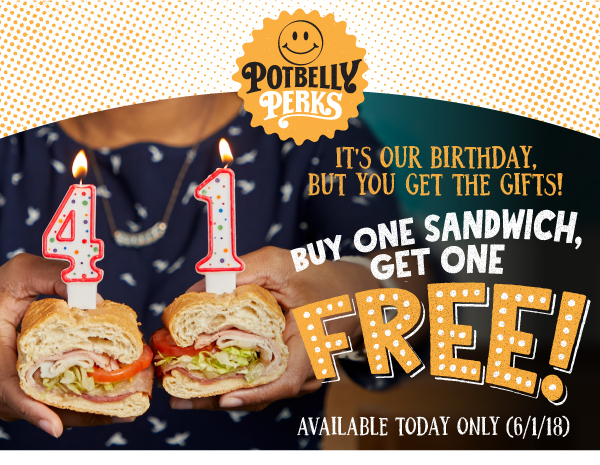 Today, June 1st, is Potbelly Sandwich Shop's 41st birthday and they are celebrating by offering a B1G1 FREE Sandwich coupon! To redeem this offer, just order two sandwiches or entrée salads (or one sandwich and one salad) using your Potbelly Perks account (free to join), and the equal or lesser-priced item will be deducted from your total. Head over here to find your closest Potbelly’s location.